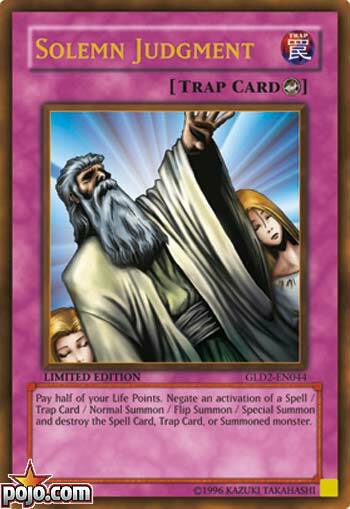 Solemn Judgment was released in the second set of the game before Konami knew of its true potential. Konami had just developed the game and weren’t aware of the implications of the game not having a cost system. Without a nuanced cost system like MTG’s mana, Konami tried to balance a card like this by giving it an extremely powerful effect yet a large life point cost. Players didn’t capitalize on its potential early on either because it was expensive to get 3 copies of, risky to play and required the deck to be built around it. It wasn’t overpowered in the sense of being a staple card for every deck or a card without drawback, but there are several reasons why I feel like it wasn’t a good card for the game. 1) Lack of consistency. Early-game, it costs 4000 life points which is ridiculous. However, late-game the card could very well only cost 250-500 life points to activate. As a result, this card could both win and lose games by itself. 2) Is mostly used in less interactive decks. The majority of the decks that used Solemn Judgment (x3) were cancerous. Stall Burn decks, Macro Cosmos decks, Skill Drain decks and basically many decks that used floodgates which prevented the opponent from making a move, making Heavy Storm not much of a deterrent at all. It also was used for some aggro/OTK decks to prevent the opponent from having any answer during the one turn they need to protect themselves. 3) Forced players to fight a counter-trap war. Since Solemn Judgment could only be countered by another Solemn Judgment or a counter trap, players either would have to substantially change their deck or just accept that they won’t resolve their important plays. Eventually this card was banned around the time of Judgment Dragon and Dark Armed Dragon. At that time, power creep accelerated so much, Solemn Judgment became a staple because a variety of different cards in the game had so much impact, people were willing to risk life points to stop them. However, a case could be made that we could’ve seen fraction less of degenerate decks if this card were never released to begin with.